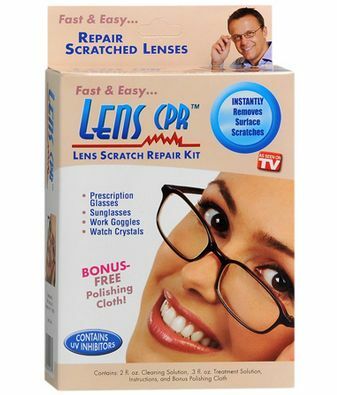 The quick and easy way to repair scratched and cloudy glasses! Lens CPR is a new polymer-based formulation which assists in repairing surface scratches and cloudiness in eyeglasses, and can also be used on watch faces made of polymer material. Lens CPR's unique two-step process thoroughly cleans the lens and prepares it to receive the lens treatment solution. The specially designed Lens Treatment then self-levels and conforms to the unique shape of each lens, drying to an invisible, clear finish and leaving the scratch virtually undetectable! Save money on expensive lens repairs and replacements with the amazing new Lens CPR. Includes: Micro Cleanser Pre-Treatment Solution, Lens Treatment Scratch Filler and Sealer.